I don't talk about hair products often because quite frankly, I'm awful with hair. I wear it straightened in a ponytail pretty much every day. I'm an art student, so doing elaborate curls or fun updos isn't all that practical because I'll come home immediately to wash the plaster dust out of it. However, my locks have been looking rather scruffy lately, because the ends are dying. 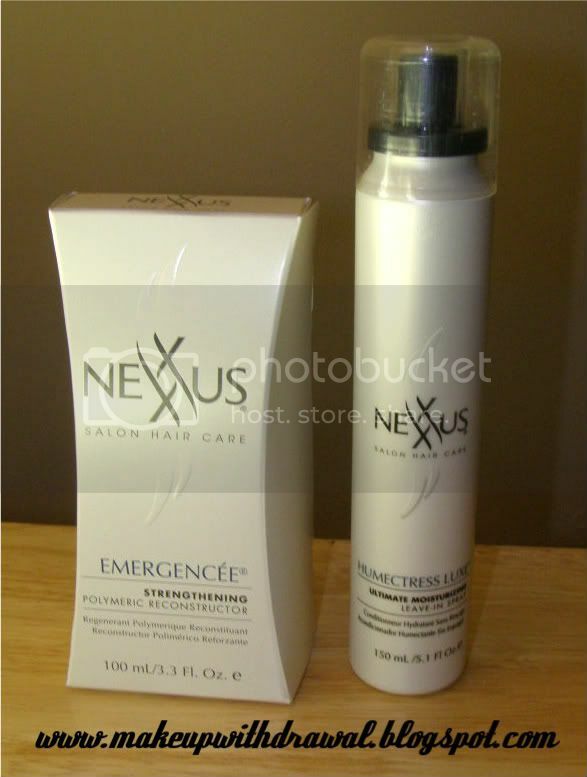 I picked up a couple Nexxus products at Walgreens because they were BOGO50%. Emergencee is a strengthening polymeric reconstructor. You get a small bottle (3.3 fl oz) for around $15. It's not to be confused with a deep conditioner, nay it's like steroids for your hair. I've used it twice since getting it, and the results are interesting. The difference isn't visible (I tried taking pictures for you, but the before and after looked the same) but you can definitely feel it. The main ingredients are collagen and proteins, and the stuff smells kind of like burnt Jello. You're supposed to apply it to your hair between shampooing and conditioning, when it rinsed out my hair felt... clean. Rubbery clean. Like it was clarified. But it really amped up the effects of my conditioner, like it paved the way for my hair to take in moisture again. After two uses (a week apart) each hair feels much stronger. Ah, the Humectress Leave In Conditioner Spray. Well, I'm not convinced that it's doing anything to be honest. I know it's there because if you spray it on and don't comb it through your damn hair, it gets sticky, heavy and hard, like hairspray. But I don't actually feel like my hair is any softer, I'm hoping that given more time, it'll work better. Alright, that's all for this weekend! I'm off to enjoy a few Cadbury cream eggs with my fiance. Good night!